iDigFossils has moved the EdTech needle another giant step forward using modern technology in an educational setting. iDigFossils exposes students to high-level STEM concepts using advanced 3D technology while captivating their attention for learning. 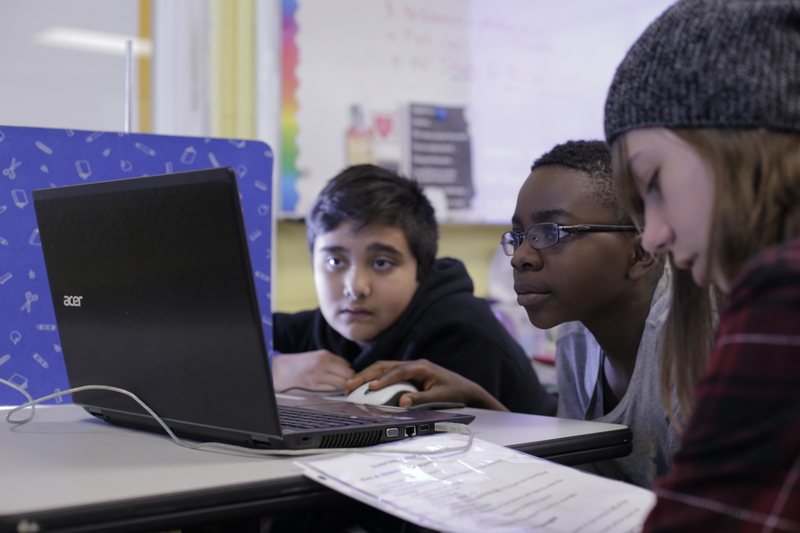 The program’s unique approach hits the sweet spot of student engagement. Many a schoolteacher has wished for a magic potion to sprinkle on her students to capture their interest in science, technology, engineering and math. Alas, student engagement isn’t found in a bottle. But a team of educators led by scholars from the College of Education and the Florida Museum of Natural History are prototyping what may be the next best thing: Hands-on lessons that seem irresistible to young minds, allowing students to study fossils–such as beguiling prehistoric monster sharks–by using 3-D scan and print technology to create near-perfect replicas of rare fossils. Since the fall of 2016, hundreds of schoolchildren in California and Florida have been sinking their teeth into complex subjects such as evolution and climate change by accessing the vast collections of fossils found at Florida Museum of Natural History at UF. The museum’s most notable specimen undoubtedly is the “charismatic” megalodon, a species that scientists believe grew to lengths of more than 50 feet and possessed a bite powerful enough to crush automobiles. 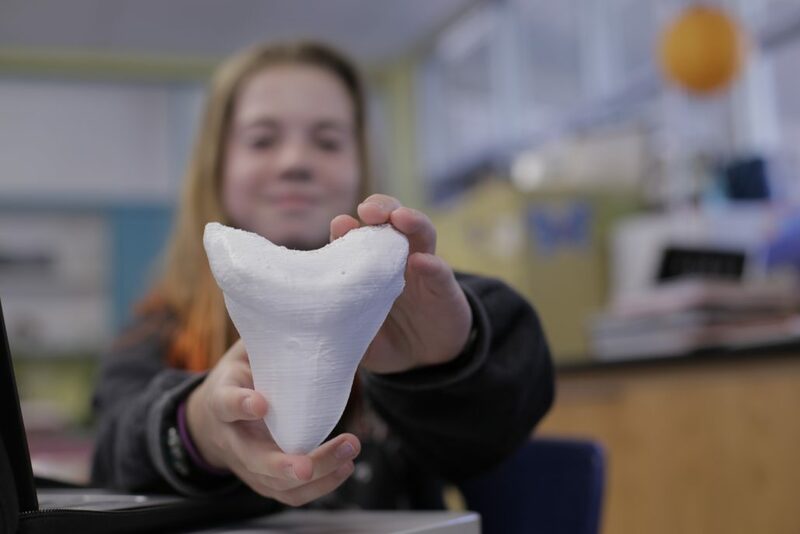 In one activity, students print a complete set of 46 megalodon teeth from high-resolution 3-D scans of fossils at the museum and measure them to estimate the length of the body of what had once been the ocean’s apex predator. Known as iDigFossils, the project received a three-year $1.2 million grant from National Science Foundation in 2016 to create a stimulating scientific curriculum using fossils and 3-D scanners and printers. iDigFossils is part of a national effort to spark interest in STEM and related careers at a time of growing concern that the United States lags behind other advanced industrial countries in students’ scientific literacy. Research shows that children who have hands-on opportunities to actively investigate natural settings and engage in problem-based study gain skills, knowledge and motivation to learn more. Yet educators say creating highly immersive and integrated STEM lessons seems near impossible because the disciplines are taught separately in schools and all the knowledge in the world doesn’t easily translate to effective real-life lessons in K-12 classrooms or meeting Common Core State Standards. This is where iDigFossils comes in. Paleontology, the study of fossils, is an ideal way for schools and teachers to integrate STEM disciplines because it involves so many subjects, including biology, geology, anthropology, math, chemistry and geography. Add 3-D technology and hands-on tasks such as making models, plus most kids’ fascination with old bones, and it’s no wonder the researchers are optimistic about the early results of the project to engage scientific inquiry among elementary, middle and high school students. The project also could serve as a poster child for interdisciplinary collaboration at UF: It grew from a chance meeting on an airline flight between Antonenko and Bruce MacFadden, distinguished curator of Vertebrate Paleontology of the Florida Museum of Natural History and co-principal investigator of iDigFossils. The scholars began talking about using technology to improve STEM education and they soon recruited Claudia Grant, a web designer at the museum with a master’s in art history and an interest in exploring how to spread scientific knowledge online. Grant has entered the Ph.D. program in the College of Education and serves as manager of iDigFossils, which forms the basis of her dissertation. The project team also includes UF scholars in computer science and engineering, and geologists from UF and Iowa State University. So far, 18 teachers at 10 elementary, middle and high schools in California and Florida, including UF’s P.K. Yonge Developmental Research School, are participating, with many more expected to sign on. Each school received 3-D printers and scanners. Teachers receive stipends and attend a weeklong, professional-development summer camp to learn from each other. A third-grade teacher in Santa Cruz, Calif., had her students explore the difference between mammals and reptiles by analyzing 3-D printed fossil skulls. Mayra Cordero, a sixth-grade science teacher at P.K. Yonge, plans a lesson involving manatees, the beloved sea cows found in Florida. Henrickson, the Tampa teacher, teamed with an art teacher on a months-long STEAM project (adding art to STEM) in which students built a life-size replica of a megalodon jaw by affixing 3-D printed shark teeth to masking-taped and painted swimming pool “noodles” (foam flotation devices). Students even did the work of museum curators—composing descriptive placards and exhibiting the six-foot-tall model in a school art show. Grant uploads prepared lessons to the project website, www.idigfossils.org, available to teachers worldwide. Fossil images are scanned and uploaded to open-source computer databases for sharing the museum’s vast collections with students and the global scientific community. Through iDigFossils, the researchers want to prove that activities combining science, math, model making and even art and communications can spur deeper student engagement and learning. That’s the first step to train the next generation of not only skilled scientists, technologists and engineers but lifelong learners.